Joan Barata, PhD, is an international expert in freedom of expression, media freedom and media regulation. Dr. Barata is currently a Founding Partner and Senior Consultant at CommVisions. Previously, he was the Principal Adviser to the Representative on Freedom of the Media at the Organization for Security and Cooperation in Europe (OSCE). 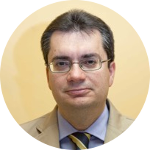 He also has a regulatory experience as Head of President’s Cabinet and Secretary General of the Catalonia Audiovisual Council and member of the Permanent Secretariat of the Mediterranean Network of Regulatory Authorities. He has taught at several universities and published several books and articles on media freedom and media policy and regulation. He regularly provides assistance to several institutions and organizations, including Internews, IREX, the Council of Europe, USAID or the Organization of American States, working in countries such as Thailand, Morocco, Tunisia, Lebanon, Jordan, Albania, Hungary, Liberia, Egypt, Dominican Republic, Colombia, Ecuador and the United States.